We hope you enjoy this month's newsletter -- Be Your Own Placebo: Learn how to use the body's natural healing process to prevent and recover from running injuries. If you find this information helpful, please be kind and share it with your running friends and anyone else who may be interested in a more natural way to stay healthy! I recently finished reading a book that my son gave me, Super Brain by Deepak Chopra and Rudolph E. Tanzi. This book demonstrates from a scientific perspective how we can learn to better use our brains for improved health, happiness and well-being. All suggestions in the book are supported by scientific evidence. One of the more simple suggestions in the book is to try to rely on your memory in order to develop and strengthen it. It suggests that you try to remember things rather than writing them down. For example, when you are shopping, try to remember the things you need to buy rather than writing out a list. This book also discusses the placebo effect which is very real and proves how strong the mind and body connection really is. If we can alter the health of our body just by thinking that we are going to get well from a sugar pill, then we should be able to re-create this process with the right conditions and without the deceptive sugar pill. 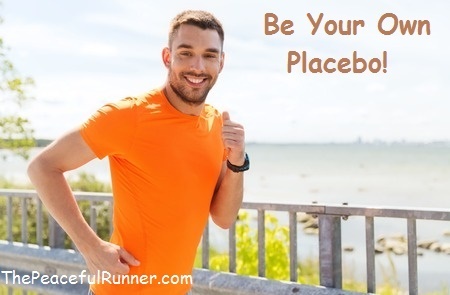 One section of the book that I felt could really benefit runners in the prevention of and recovery from running injuries is the section on "How to be your own Placebo." The placebo effect basically involves self healing in which the mind is cooperating and contributing to getting well. Fear and doubt are not interfering in the healing process as they often do when we are injured or ill. If we cut our finger, we don't worry and wonder if it is going to heal. We trust that it will heal on its own and we let it go. The mind doesn't interfere and bring doubt and fear into the picture. Your mind trusts the healing system in your body and you forget about it. We need to develop the ability to do this with all injuries and illnesses. This ability starts with a strong mind and body connection and a mental intention to heal or to prevent injury or illness without deception. When the mind and body connection is strong, the body is in constant communication with the mind. Your follow your instincts and discover what it is that your body needs to heal or to stay healthy. Then you allow the healing response to take place without interfering. Fear and doubt are not present. Developing a strong mind and body connection is not difficult but it does require patience and time. However, it can become your best defence in preventing injury and illness from creeping into your life. It doesn't have to be complicated but it does have to be a consistent practice. A simple way to practice is to sit quietly with eyes closed and feel your body. Sensations will arise and come to the surface. Allow the process to happen without reacting to what you are feeling. Just relax with each sensation as it enters your awareness. Notice where each sensation comes from. Try to find its source. This exercise helps us to become more aware of the quiet messages that our body sends. We usually only listen when the body speaks loudly such as when we experience sharp pain, illnesses, stiffness or other discomforts in our bodies. As you practice you will be increasing your sensitivity and trust at the same time. There is still much to be understood about the healing process. But because we know the placebo effect is a real phenomenon, we know that we have a part to play in our own healing. If we can learn how to be our own placebo, we can be prepared for any injury or illness that arises and approach it with confidence rather than with fear and anxiety. Until next month, keep running, smiling and be happy, healthy and peaceful!